This year, Time is honoring the people it's deemed the 100 Most Influential by having other influential people write their profiles — Dolly Parton wrote about Miley Cyrus, President Obama wrote about the Pope, Madeleine Albright wrote about Vladimir Putin in what will surely go down in history as the "Ether" of diplomacy. While most of the famous-on-famous profiles turned out just fine, Fox Anchor Megyn Kelly's Time 100 profile did not. 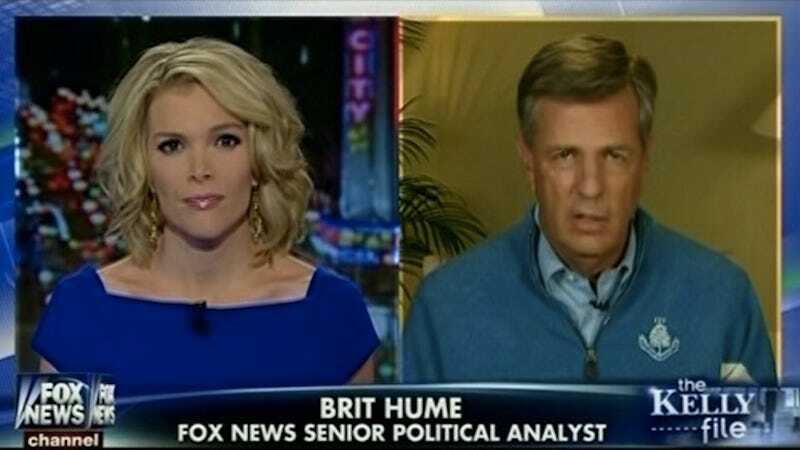 That's because hers was written by Fox News senior political analyst and old timey sexism fossil Brit Hume. When I saw that Hume had written Kelly's profile, all of my brain's thinking parts winced. Maybe it won't be too bad! I thought. Ten years ago, my wife Kim, then Fox News' Washington bureau chief, walked into my office carrying a videocassette. "You have got to see this," Kim said. It was the audition tape of a local TV reporter then named Megyn Kendall. She was a lawyer and new to the business, but her tape displayed as full a set of the qualities of a network correspondent as I had ever seen: great looks, strong voice, authoritative yet cheerful presence and obvious intelligence. In other words, limitless potential. And then just keeps hobbling down that same wrong foot path. "Please," I asked Roger, "just look at the tape." I suspected he would see what I had seen. He did, and an opening was created. As Salon's Kate McDonough notes, Hume's comments on Kelly are even more out of place considering every other person who wrote about a woman on the Time 100 managed to do so without harping on her looks. Sheryl Sandberg uses words like authenticity, honesty, leadership, and boss to describe Beyonce. Dwyane Wade describes Serena Williams with words like hard working, disciplined, and "a true champion." There's no ode to Kerry Washington's famed beauty, or Amy Adams's looks. That's because the entire point of the Time 100 seems to be to celebrate the achievements and qualities of individuals beyond the superficial. That's not to pretend we live in a world where looks don't matter — they do, especially in cable news, and especially if you're a woman, but citing Kelly's as a factor in her success when she's had an entire career to prove she's more than a pretty face is tacky as hell on Hume's part. Although, in Hume's defense, his profile of Kelly was not nearly as tacky as the tongue bath Karl Rove gave the Koch brothers in the same feature.